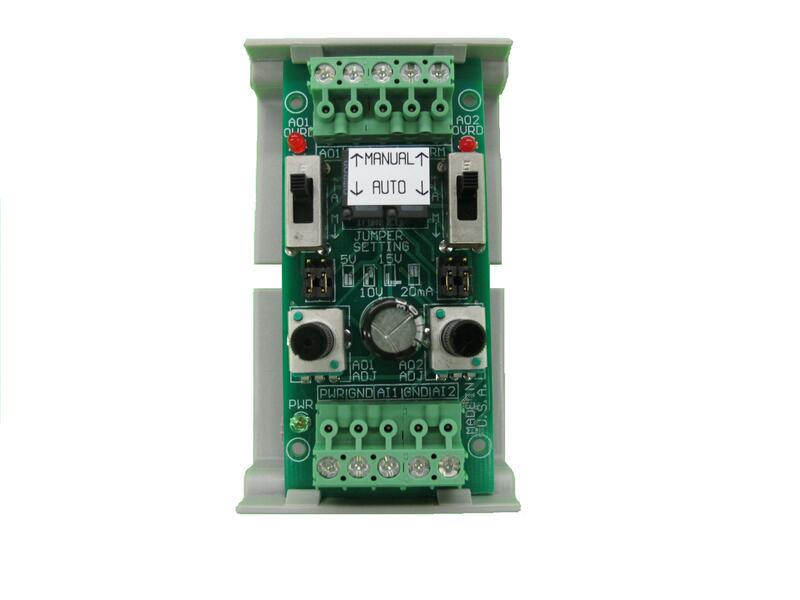 The Analog Dual Override Module (ADOM) allows users to override the analog signal provided to another device and provide a manually adjusted analog output value. Two separate analog input signals can be connected to the ADOM to control two separate analog devices on the output terminals. Under normal operating conditions with the slide switch in the automatic (“AUTO”) position, the ADOM passes the analog signal provided on its input terminals directly to its output terminals. 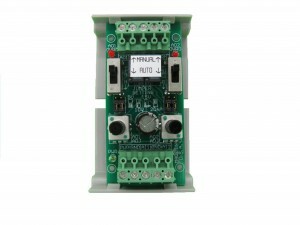 By moving a slide switch to the manual (“MANUAL”) position, the ADOM will provide a precise and stable analog voltage or current to the device connected to its output terminals and disconnect the analog sign provided on the input terminals. The ADOM can be powered with either AC or DC voltages. A green LED indicator is illuminated providing confirmation the ADOM has voltage applied at the power input terminals. The power supply inputs are protected from voltage transients or spikes that could damage the ADOM. No signal conditioning or protection is provided on the analog input or output terminals. The module is placed in an open frame track that can be mounted to a metal panel or 35mm DIN-rail with appropriate mounting clips. The mounting clips are not provided with the ADOM. Current: 1 .0 A max. Voltage or Current: 0-5 VDC, 250 ohm min. Jumper Selectable: 0-10 VDC, 500 ohm min. ; 0-15 VDC, 750 ohm min. ; 0-20 mA, 750 ohm max.